I’ve had an opportunity over the years to tryout a few versions of the Kreg pocket hole jig and I’ve always been impressed with their ease of use, repeatability and accuracy. It’s not that Kreg radically redesigns the jigs each time, but instead they make small improvements to their look and feel that make them more user friendly while still working exactly the same way. A little while ago Kreg sent us a new K5 Pocket-Hole Jig to use in the basement workshop. Considering I’ve always been happy with the K4 I was a little skeptical that I would see any significant difference between them. As I suspected, the results were the same when it came to accuracy and repeatability but the big difference, as far as I’m concerned, is in its easier to use clamping system and its support wings. Both a very nice touch! 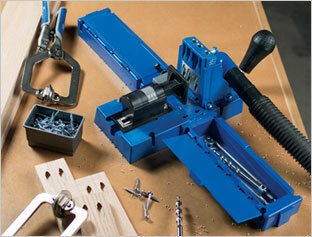 Considering purchasing a Kreg pocket hole joinery system? The K5 is a very nice model to add to your shop. To expand the range of materials you can use it on, you can eventually add both the Micro Drill Guide System and the new HD Jig for 2x lumber. Great review! Very comprehensive and thorough! The K5 is now at the top of my Christmas list! Thanks Rick! If you receive it for Christmas, don’t let your family get mad if you head out to the shop immediately to start building with it LOL! When my K4 eventually wears out, I may have to pick one up. Sounds like a solid plan for the future! Matt, I am considering the Steel City jointer and can’t find what I would consider neutral reviews on the name brand. Seeing your SC band saw did wonders for me. what other SC equipment might you have and how do you feel about them? I would take your thoughts to heart towards my next purchase. I am a new woodworker and although not wealthy I do appreciate good equipment and work towards that better than average piece if at all possible. also asking your thoughts here: granite tables or cast iron and why….. thanks Matt for your insights! Jerry, I also have a Steel City floor model drill press, 8″ jointer and an overhead air cleaner. I once had a Steel City Tablesaw, but I upgraded to the SawStop. I don’t remember the model numbers, I never do LOL, but I’m very happy with all of them, they work great and do everything I expect from them. Probably the only complaint I have is with the granite topped tools and that’s simply that they’re heavy! But other than that, I’ve been extremely happy with them. In regards to granite versus cast iron, I keep hearing from people saying how they’re convinced the granite will shatter if you drop something on it or hit the right way, but never came close when I did it and the staff at Steel City told me (when I asked) that yes some have broke, but that was usually due to extreme shipping issues not normal wear and tear. Can the granite chip if you hit just right? Yes, and I actually chipped part of my Tablesaw right near the mouth of the blade, but that was me being stupid and trying to remove a zero-clearance insert with a screwdriver rather than doing it the right way lol. A huge advantage of the granite is that because of its weight they’re actually much quieter than their all-metal counterparts, and they also don’t vibrate nearly as much. I have no hesitation to recommend Steel City tools, I think they work great and have had great results with them. Matt, that doe indeed help so thanks, especially for your time. I will be stopping by your social homes more and more i’m sure. Again, thanks for the info!